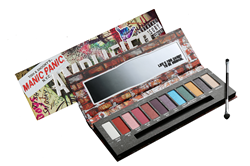 MANIC PANIC, the iconic hair color and cosmetics brand founded by punk rock sisters Tish and Snooky, continues to celebrate their 40th year of cutting-edge beauty with the launch of the Hot Topic x MANIC PANIC Amplified Eyeshadow Palette. The iconic brand has teamed up with long-time retail partner, Hot Topic, to create an exclusive palette that harks back to the brand’s New York City punk rock roots. To commemorate MANIC PANIC’s accomplishments, Hot Topic will be partaking in the anniversary with in-store promotions and social media video content featuring Tish and Snooky. The Hot Topic x MANIC PANIC Amplified Eyeshadow Palette features a beautiful array of twelve shades, named after MANIC PANIC’s most colorful and iconic hair dyes including Virgin Snow, Ultra Violet and Vampire Red. Like all of MANIC PANIC’s hair color and cosmetics, the Amplified Eyeshadow Palette is vegan and cruelty-free. The graffiti case is inspired by the walls of former punk rock hotspot, CBGB, and includes a large mirror and double-sided brush for easy application. In addition to the Amplified Eyeshadow Palette, Hot Topic also carries cult-favorites from the line and MANIC PANIC’s exclusive Formula 40 collection, which lasts up to 40 washes. The Amplified Eyeshadow Palette is now available for $11.90 on http://www.hottopic.com and all Hot Topic stores nationwide. Tish & Snooky’s® MANIC PANIC® NYC began on 7/7/77, when two N.Y.C.-born sisters, Tish and Snooky, added some extra ambition to their rock ‘n’ roll lifestyle. At the time, the sisters were singers in the original Blondie lineup, and few of the people who helped to ignite the late 70’s PUNK scene would have ever dreamt of the company's current acceptance by the mainstream. Tish & Snooky, dubbed “The Martha Stewarts of Punk”, still rock the Manic Panic® lifestyle. “We don’t just sell it, we live it!” For more information, please visit http://www.manicpanic.com and http://www.manicpanicprofessional.com. Hot Topic®, headquartered in City of Industry, CA, was the first retailer to make alternative apparel and accessories available at malls across the country. Today, Hot Topic is the fandom haven for guys and girls obsessed with music and all things pop culture. Founded in 1989, Hot Topic operates 697 stores in the U.S., Canada and Puerto Rico and an online store at hottopic.com. For more information, visit http://www.hottopic.com and follow @hottopic on Facebook, Twitter, Instagram and Snapchat.